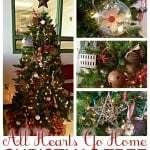 Have you started thinking about Christmas/End of the Year gifts? Don’t wait too long, it’ll be Halloween before you know it and then the holiday season is upon us! 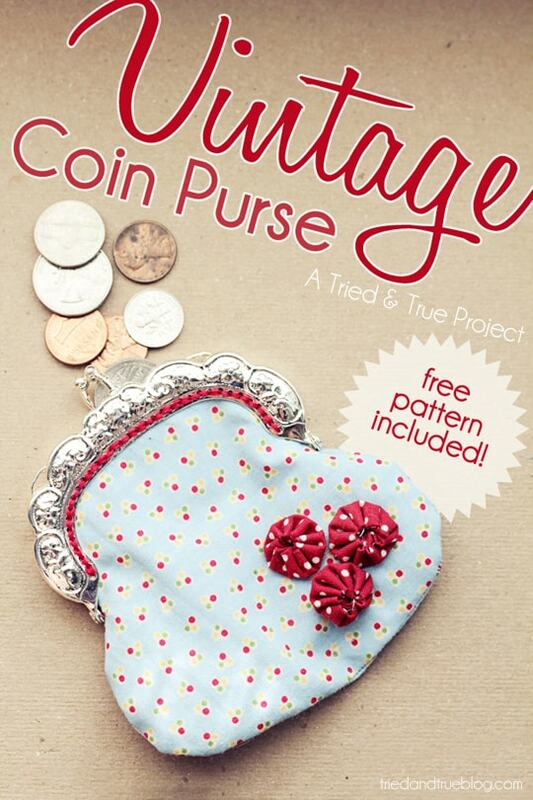 Here’s an easy Vintage Coin Purse tutorial I made for Crafts Unleashed that you can whip out for the women or teens in your life! 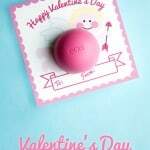 This post may contain affiliate links for your convenience and to help in the maintenance of this blog. 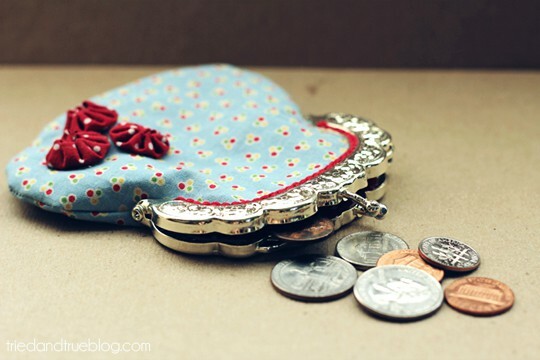 I love coin purses. They’re just so useful, so little and so cute! 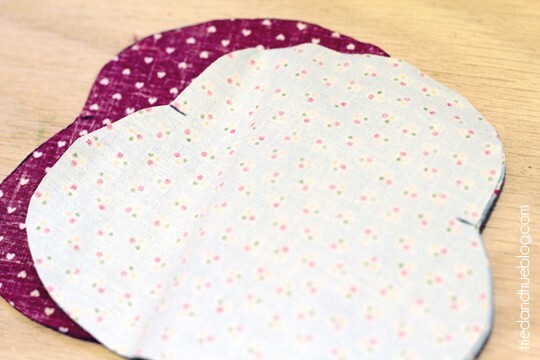 I also love that they’re a great gift that, if you sew, can come together pretty quickly. 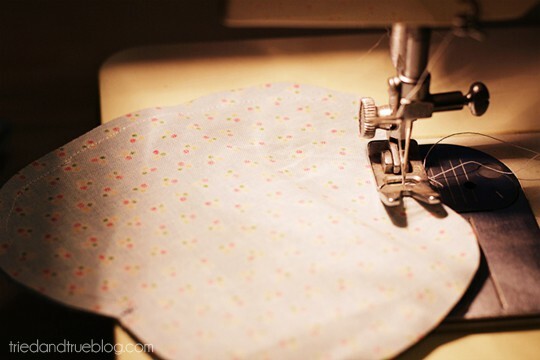 And if you don’t sew, they’re a perfect beginner project! 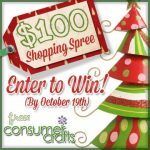 Consumer Crafts has adorable (and super reasonable!) Vintage-Style Coin Purse Frames, but it doesn’t come with a pattern so I whipped one up. Hope you enjoy! 1. 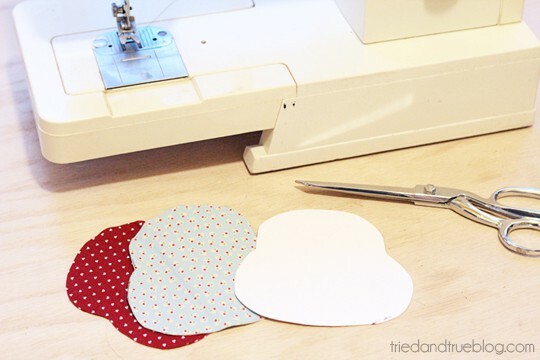 Using the Free Coin Purse Tutorial Pattern, cut out four pieces of fabric of your choice. 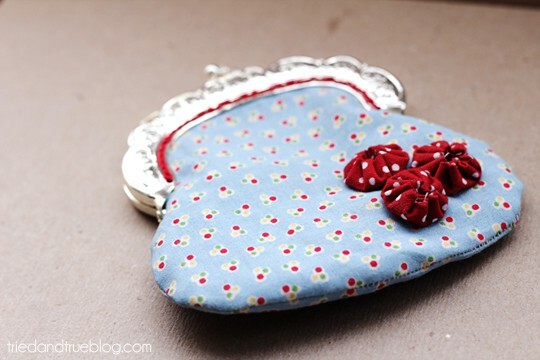 In my example, the light blue fabric will be the outside of my coin purse and the red will be the lining. 2. 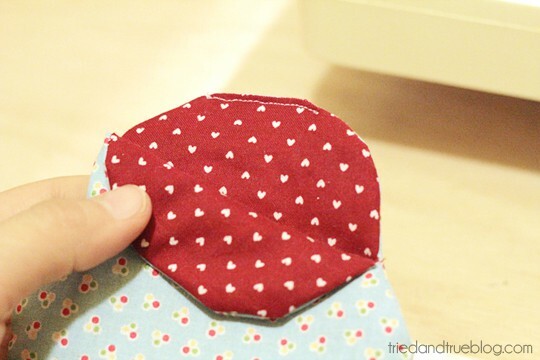 With the right sides facing each other, mark the edges of the Coin Purse Frame. 3. 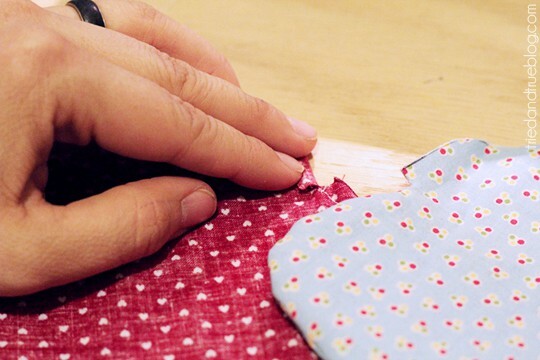 Sew the bottom of the outside fabric from one marking to the other. Repeat with lining. 4. Make a small (1/4?) 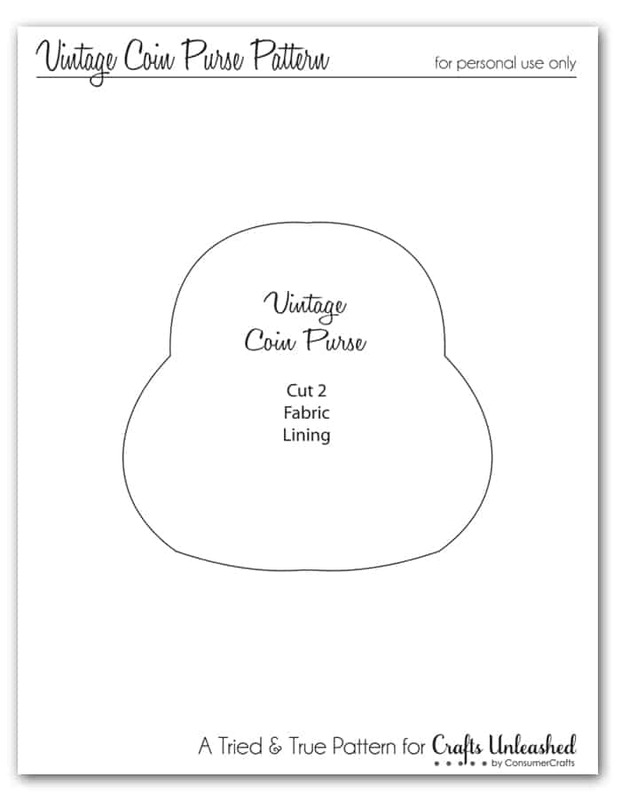 snip where you marked the Coin Purse Frame ends. Turn outer fabric right side out. 5. 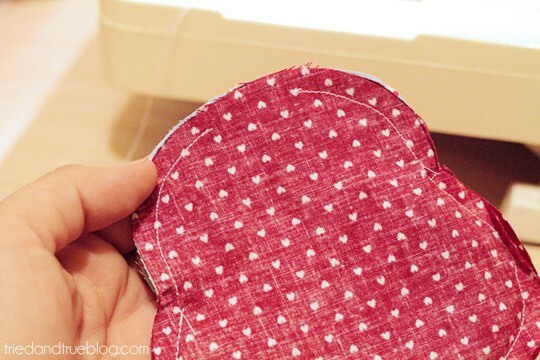 Place the outer fabric pouch inside of the lining pouch (right sides facing). Making sure to keep the flaps aligned, sew the top flaps together from one marking/slit to the other. Make sure to leave a small opening in one of the flaps (pictured below). 6. Turn right side out and press. You may find it useful to use a pencil or chopstick to help you turn the corners out. Sew the small opening shut. 7. Now you’re going to hand stitch the pouch to the frame. I found it handy to keep the pouch flap in place with two small pieces of tape. I just sewed right through them and then tore them off when the stitching was complete. I used a full strand of embroidery floss with a really large needle, but you could also just use a normal needle and thread. 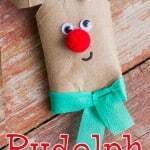 So easy you can make one for a gift and one to keep for yourself! 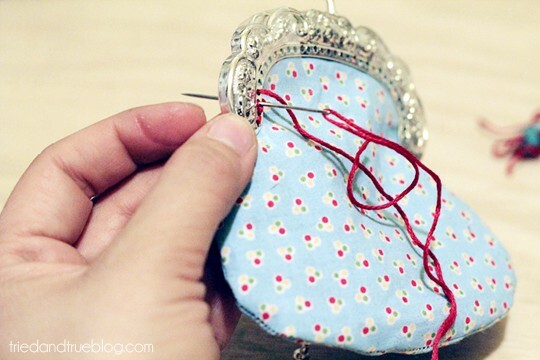 Hope you enjoyed this coin purse tutorial! Let me know if you have any problems with the pattern! It is adorable! I love the color combination. Pinning this for sure! Sooooooooooooooo adorable! Love the fabric and embellisments! Pinned! Thanks, Heather! 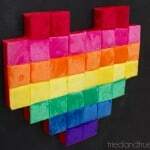 It's a great way to use up scraps too! Absolutely you could hand sew them! Thanks for visiting! I think this is awesome! I love that there is hand stitching too. I've made zippered pouches but this one is way more fun! Awh, I'm glad you like the Coloring Prints. Thanks for visiting! I don't think I have ever seen a clasp that allowed for sewing it to the bag. I love this. What a great project and thanks for the resource links. Oh my stars this is about the most darling thing I have ever seen! Pinning asap! Thank you so much, Malia, for both the sweet comment and for sharing the project! Can't wait to try this. 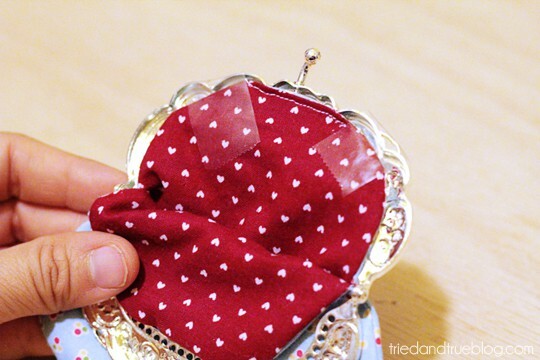 I have always wanted to do sew a coin purse. 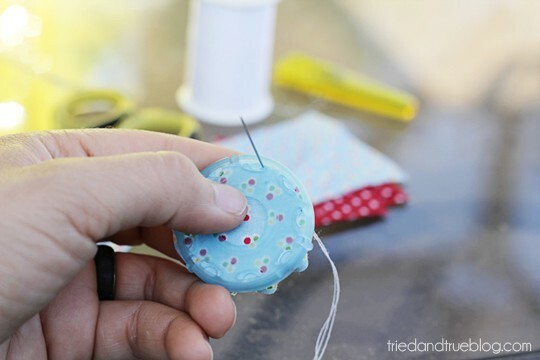 The mini yo-yo's & fabric are super cute. Enjoyed my visit today & now a new follower. 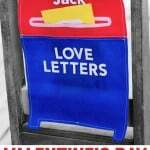 I just made one....I love it....the only thing I'm not sure about is there is a small gap either side where the hinge goes.. Mine has that little gap as well! Could you tell me what size coin purse frame you used for this?